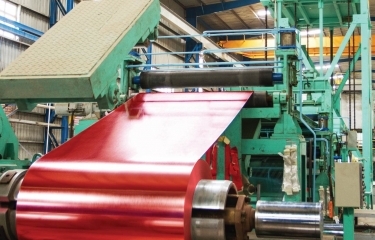 Currently, Ton Tan Phuoc Khanh, the color coating lines (CCLs) located in the Head Office used to manufacture the pre-painted steel sheets which are so-called pre-painted galvalume. After the coil rolled coil, galvanized and galvalume are put into the pickling system, it shall be covered with an additive layer to improve the paint’s adhesion. Then it shall be applied with a primer, official painting layer and put into the oven. The painting layer enhances the sheet’s weather shield resistance and aesthetics. Capacity of each line: 100,000 tons/year.